I have to say, these babies are so tasty I’d like to make them every week. In fact, maybe I will. When cooked traditionally, they are fried and delicious (thus “fritters”). But if you’re not feelin’ the oil, you can also cook them like little pancakes on a dry griddle and they’re still completely satisfying. I’d argue that some oil (when properly chosen) is good for us sometimes, but if you’ve been overdoing it recently, perhaps the lighter version is for you. The inspiration for this recipe started with a friend mentioning leek fritters a few months ago and it getting stuck in the back of my brain, only to pop out when I saw ramps (wild leeks that come out early in the season) being offered on Idaho’s Bounty, our local/sustainable food co-op. After perusing a recipe in Ottolenghi’s beautiful book, Plenty (if you don’t have it, it’s terrific for inspiration! ), and Googling about, here’s what I came up for a gluten-free version, with a little extra vegetable-y goodness from our old friend, the zucchini. I can only imagine how many of these I’ll want to make when true zucchini season is upon us and we’re drowning in those over zealous growers. Along with zucchini bread, chocolate zucchini cookies, ratatouille, grilled zucchini… Oh, it’s not summer yet? I’m getting ahead of myself, I guess. 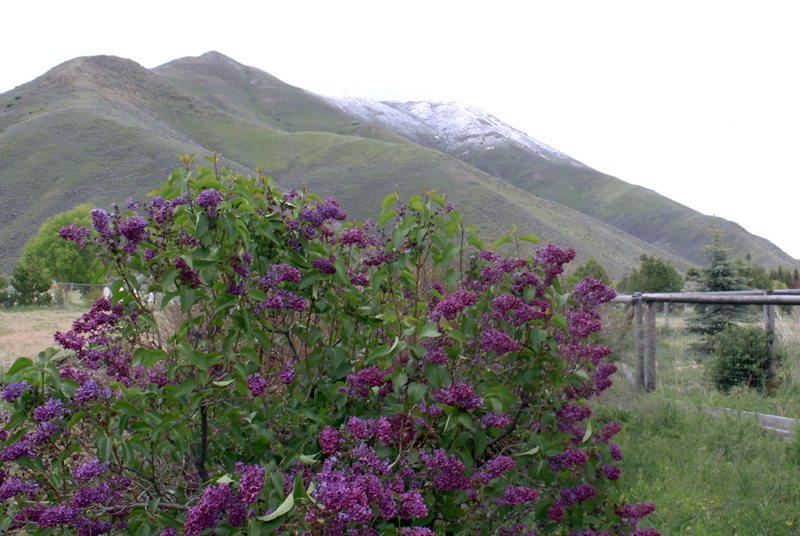 But what else can you do when looking at a confusing combination of blooming lilacs and snowy mountain tops at the end of May?! Ah, Idaho, I do love you, crazy spring weather and all. But I digress. Even though I originally used ramps in this recipe, I’m writing it with the traditional and more commonly found leek. 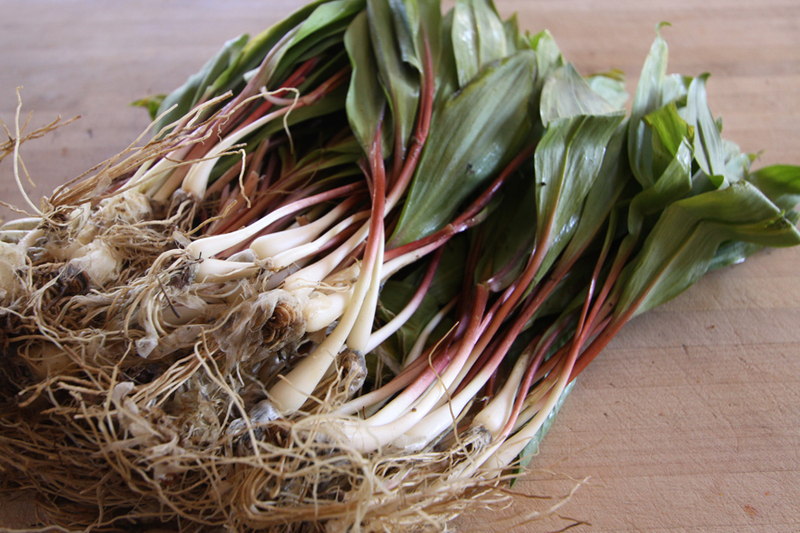 However, if you’re lucky enough to get your hands on ramps, go for it. Use a pile. In the end you want to end up with a mixture that is 1/2-2/3 vegetable to batter. Go nuts. Trim the ends and tough greens off the leeks and slice the remainder down the middle lengthwise. Gently rinse them under water to make sure no sand is left in the folds. Slice into 1/4-1/2 inch pieces. Mince the shallots. Grate the zucchini with the large grate side of a box grater, or the equivalent. Melt the butter with the olive oil in a large pan and sauté the leeks & shallots on medium heat until completely tender. Add the zucchini and cook just a minute or two to evaporate off some of the liquid. You want the zucchini a little “al dente” at this point so it retains some texture when you cook the fritters. Set aside to cool a bit. Mix all the dry ingredients together in a large bowl and stir in the kefir and eggs. You can use a whisk to get rid of any large lumps. Let the batter sit while you blend together all the sauce ingredients in a food processor. Cover and refrigerate sauce until ready to use. Add the sautéed veggies to the batter and mix together well. Now the moment of truth… to fry or not to fry. I’ve done it both ways, depending on my mood and an inexplicable weighing of what I’ve eaten recently. Fried is tasty and satisfyingly sinful, but honestly the dry pan method is pretty darn good, too, and much less messy and dangerous (and fattening)… so whatever. Fried method: Heat a large, heavy bottomed pan with a thick layer of whatever light oil you prefer for frying (canola, sunflower… I’ve even used olive oil, though it is a bit heavier). Drop spoonfuls of the batter in and flatten slightly. Don’t put too many in the pan at once since you need some maneuvering room to flip them. When they’re nicely golden brown on the bottom, flip and cook until the second side is done. Transfer to a plate lined with several layers of paper towels to soak up any extra oil. Repeat until all the batter is gone and add more oil to the pan as needed to keep the bottom completely covered. Be careful of the spattering oil… these suckers can be quite an adventure! Pancake method: Heat a non-stick griddle on medium to medium-high (till a drop of water bounces & evaporates quickly when dropped on the pan). Place spoonfuls of batter on the pan and flatten slightly one at a time. Flip when golden on the bottom. Transfer to a plate and continue till finished. You may need to turn the heat down a bit after a few rotations, depending on your stove and griddle. You can either serve these at room temperature or keep them warm in a low oven until ready to serve. 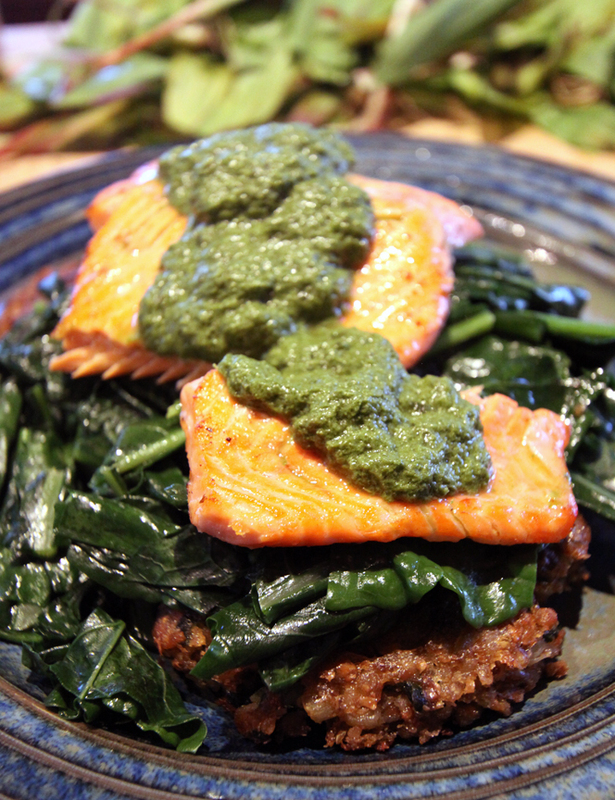 They’re terrific as an appetizer just with the sauce; or make them a light dinner served on a bed of greens with the sauce as your dressing with an extra wedge of lemon; or go for it and serve them with sauteed kale & swiss chard, salmon and sorrel sauce (perhaps I’ll post that as an official recipe soon…). YUM! Note: See my explanation on cooking with alternative flours if you’re wondering why I’m using all those crazy flours and not the ubiquitous combo of rice flour and xantham gum you usually see in gluten-free recipes. This entry was posted in Appetizers, Recipes, Vegetable Dishes and tagged Candida Diet, Gluten-Free, Kefir, Leeks, Ramps, Vegetarian, Zucchini by Brooke Bonner. Bookmark the permalink. SO many people have been cooking with them recently, but we don’t really get them here – I hope I find some soon. I’ve never even tried them. aren’t they SO pretty? !